Everybody wants something for nothing. Coupon shoppers clip, Internet ads beckon with "$5,000 a month from home", and every NFL general manager would love to find quality starters with cheap picks from the fourth to seventh rounds of the draft. The common misconception is that there's always a huge reserve of hidden talent just sitting untouched in the late rounds, missed by dimwitted general managers or stubborn coaches clinging tightly to a different scheme. Every once in a while, a Tom Brady or T.J. Houshmandzadeh emerges and gets fixated upon, seeming to prove that theory but really just distracting from the 50 players drafted before and after him who neither see nor deserve an NFL start. Exceptions always get more attention than the rule. Is it really sensible to look at a player who drops into the fifth round, and assume that the combined research and intelligence of thirty-one other NFL teams' scouting departments all got it wrong? Much less four times over? Teams don't struggle to find late talent because they're blind, mis-prioritizing, or risk-averse; they struggle to find late talent because it usually isn't there. The real talent gets snatched up in the first hundred picks, and the pool is left mostly dry. Even the Patriots' late-round performance has been controlled by this dynamic; it's kinda out of their hands. There just aren't a lot of diamonds to be found in the rough of the draft's third day, because everyone else is also looking for them. Any true diamonds often find themselves permanently benched behind incumbents by their teams. Traffic shortcuts and fishing spots are only lucrative as long as nobody else knows about them, right? But I know this general manager who is trying very hard to beat these very odds. He comes from an NFL management lineage that's proven this draft prowess, and he might even be close to actually pulling it off in his new job. 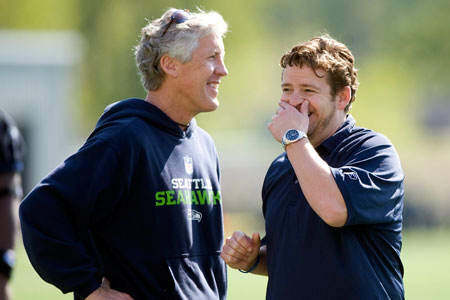 His name is John Schneider. CB Walter Thurmond, SS Kam Chancellor, and TE Anthony McCoy: the fourth-, fifth-, and sixth-round selections of the Seahawks in their first year with GM John Schneider at the helm. All held back from the field in 2010 for some non-performance-related reason or other. All disappointments if you look solely at their stat line. Interestingly, though, all three players were being assigned much higher potential before the draft. Some projected each of them as high as the second round, depending on scheme. These were guys that fell, again, due to reasons unrelated to their quality on the field. Thurmond was recovering from a gruesome leg injury. McCoy had off-the-field concerns, mostly drug issues. And Chancellor, with a limited skill set that he executes in superlative fashion, was forced down the board by a draft deep at safety. Their disappointing rookie seasons have legitimate asterisks. Thurmond and Chancellor weren't deployed as starters in 2010; Chancellor saw most of his 2010 snaps at the Bandit position while veteran Lawyer Milloy held down the starting safety spot. Thurmond was mostly eased into the lineup out of an abundance of injury caution, and nagging injury held back and eventually IR'ed McCoy. All three could still become solid starters; 2010 did nothing to erase that potential. Here's the rub: Schneider, a GM from the Packers family with a well-documented belief in Best Player Available (BPA), identified and drafted players for Seattle whose draft-day falls had more to do with circumstance than talent. Thurmond and Chancellor were what you'd call good "value picks"; their possible returns are much higher than the usual cost (second- to third-rounders). McCoy was just an out-and-out steal. Then you've got Leon Washington, a former third-rounder who basically was the Jets offense before he broke his leg. Schneider again rolled the dice against injury, buying when the Jets were selling low. "When you're talking about a pick in the fifth round," he later said, "and a player like Leon Washington, who we felt was going to be healthy enough to play at his level this season, the risk-reward ratio was a no-brainer." Consider yourselves fleeced, Jets. Also excellent was a fourth-round trade-down for RB Lendale White and DT Kevin Vickerson. Even if neither player worked out, the move was solid in theory; who would refuse to sacrifice a mere ten draft spots in exchange for two borderline/role-playing starters? It was enough of a pattern in one draft to tell us something about Schneider: he appears to have good feel for value, and believes quite strongly in his value picks. Now, if it were just Thurmond and Chancellor that Schneider drafted, there might be another explanation. Cornerback and strong safety were indisputable needs going into the draft, so they could have been labeled "need" picks just as easily. But the selection of McCoy, who played a position that was considered a rare strength on the team, hints at a different thinking: you don't pass up that level of ability when it falls that low, period. You take him, even if it creates a talent logjam. There's really no such thing; logjams at a position are just trade bait waiting to be cast. For all Schneider's claims that he loves his late-round picks, his actual body of work suggests that he seems to love value more than quantity. Whilst on the clock in the second round, Seattle received an offer to trade down 15 spots into the middle third and pick up an extra pair of fifth-rounders in the process. Schneider was tempted but stood fast, feeling greed wouldn't pay. The prize was WR Golden Tate. Similarly, Schneider "had a deal in place" to move down from #14, but only if Earl Thomas was taken already. When Thomas remained on the board, Schneider took him. That draft was a great display of restraint, sober evaluation, and BPA. In my opinion, Thurmond and Chancellor weren't pure need picks, but value picks who just happened to fill critical needs. It remains to be seen whether they'll develop; falls like theirs don't happen for no reason. Injuries and marijuana busts end careers and scare teams. But their ceilings are higher than the fourth-round talent we could have gotten by picking solely for need: Geno Atkins, Joe McKnight, Eric Norwood, or Jason Fox. Instead, Schneider started with talent and mixed in some need, rather than the other way around, handing us players with higher ceiling. By sticking with BPA in that manner, Seattle is one of the few teams who may very well net themselves great late value from the 2010 draft. Watch for 2011 draft-day falls that occur out of injury, misconduct, positional plenty, or character concerns. Schneider just might be watching the same guys. awesome piece. keep up the good work! On late round talent - I think that the late round guys that catch on in the NFL usually have a very specific skillsets that work for them in a certain system and typically these 'late-round gems' appear on better teams because that team's nucleus of stars makes everyone around them better. This may contribute to the aura that good teams draft better (or pick up free agents better, etc). Some teams have specific needs for their system and the answer can be a guy that didn't fill any need on the team that dropped them or ignored them. So JS's philosophy is essentially take the guy who fell becuase of some issue that COULD be fixed as compared to Ruskell's policy of taking the best player at a position of need who had no issues off the field? Me likey. Still wondering if the Konz pick will pay off someday. Good topic to bring back up and think about heading into the draft. Thanks. Finding late round value consistently seems like a proactive way of preventing the "injury years" that the Hawks experienced following the Super Bowl. Good teams survive injuries because they have stocked up on depth. These guys seem like the types with the athleticism to string together a few good games in that situation even if the flaws that caused their drops do in fact prevent them from becoming consistent, long-term starters. Plus, you have the upside where they just may surprise. Good stuff man. I am becoming a regular. Keep up the good work. Thanks a bunch, Steven. Spread the word! I love this evaluation of Schneider! I'm looking forward to draft day and hoping last year's apparent success can be repeated!